For about the best eight years of my childhood, I grew up in San Diego California, and it became a frequent tradition during vacation time to drive out to Disneyland. I can’t even begin to count how many times I visited that park, I knew it inside out, and my absolute favorite ride that I could never go on just once was the Haunted Mansion ride. It was such an atmospheric and haunting spectacle, with numerous details, memorable highlights, a catchy theme song and even its own gallery of unique characters. It was a special place where I felt I could be transported into a world where all my favorite spooky Halloween delights could live and breathe in this unforgettable theme park attraction. Throughout those early child hood years, I so badly wanted Disney to make a movie adaption of this ride, as there seemed so much potential and creativity to make a great, spooky family movie out of it. 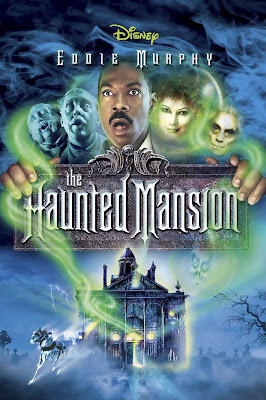 Then, after the blockbuster success of the movie “Pirates of the Caribbean”, I knew it was only a mater of time before “The Haunted Mansion” got the same treatment. The trailers started popping up the following year, and the more I saw, the more excited I got. I was just making my transition from Elementary School to Middle School, so I still had a lot of my childhood innocence, and after the movie was over … I actually loved it. No joke, I was initially calling “The Haunted Mansion” my absolute favorite movie to watch around Halloween. Then it got progressively less good with repeated viewings, to a point in my early Highschool years where I just stopped watching it all together. Now in present day, I’m in my mid-twenties, and am curious to look back on this film to see if it’s better then I remember, or if it remains as lifeless as the ghosts inhabiting it. I’ll say this, the movie begins on a very positive note as the opening credit sequence is outstanding. We get all those wonderful little details like the Disney logo dissolving into the mansion, one of my favorite vocal talents Corry Burton delivers the famous tagline “Welcome Foolish Mortals”, we have various objects floating around in a misty void, creepy imagery that quietly sneaks in, and the musical score composed by Mark Mancina surprisingly gives the film its own spooky yet whimsical identity. The best aspect of this opening is that we see brief glimpses of the mansions dark past, with no stupid narration or written texts, just visually conveying the backstory, but without spoiling too much either. I really like that, it gets me excited to discover more, while also giving me some context of the backstory. I also love the image of the lively ballroom, with small hints of something deathly tragic looming among them. It calls to mind Edgar Allan Poe’s “The Mask of Red Death”, and it’s subsequently the closest the film ever gets to being scary. Unfortunately, the film takes a sudden nose dive the second we meet our main human characters. We get a cliched set-up of an over working dad not spending enough time with his family, which perplexes him to take everyone out for the weekend. However, before they can have a family camp-out, their lured to the mysterious Grayce Mansion, under the assumption that it’s for sale. For the first twenty-five-ish minuets of this film, things move at a snail’s pace, there’s lots of padding and there’s even a noticeable drop in quality as everything from the direction, to the acting, to the editing, all looks and feels like one of those Disney channel original movies. 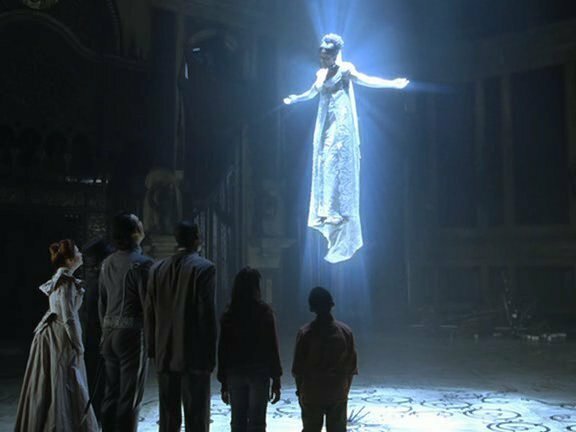 So, after a lengthy set-up, we finally discover that the master of the Mansion and all his servants are in fact dead, and are eager to lift a curse that prevents them from moving into the afterlife. After getting a hold of the family’s flyers, the mansions master deludes himself into believing that the mother is in-fact the reincarnation of his long-lost love, who’s premature death set the Black Curse in motion. Now it’s up to the father and their two kids to rescue their mother, and solve the clues to lift the curse of the Haunted Mansion. Along the way they encounter spooky obstacles, and a surprise villain (although not really surprising) is lurking in the shadows with his own sinister plan. 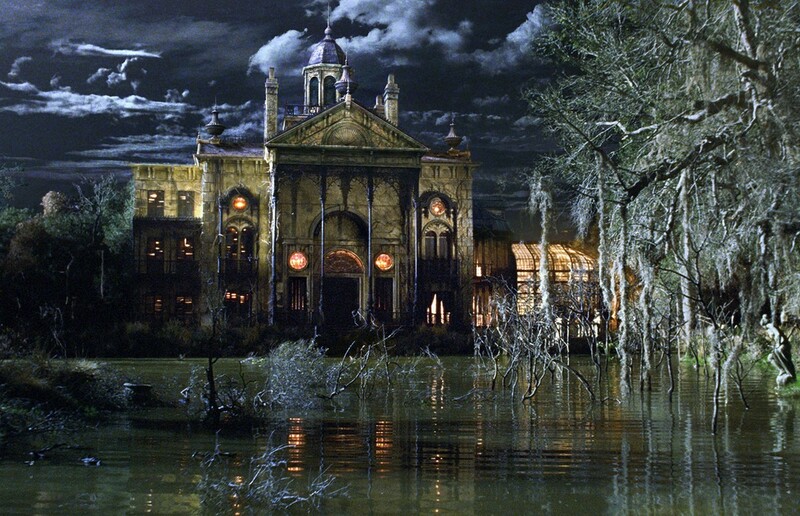 It’s not an awful concept for a film set in a haunted mansion. I like the idea of people from the outside venturing through a haunted setting, while following clues and uncovering secrets. The problem all comes down to execution, as everything just feels like it’s on ado pilot, and the script doesn’t take advantage of it’s fun, or creative potential. 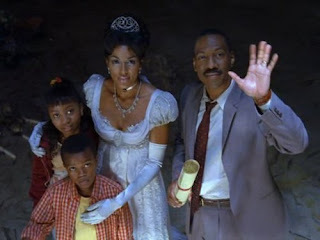 Lets first talk about our human cast, with Eddie Murphy leading the charge as the father. Now speaking truthfully, my sister and I grew up loving Eddie Murphy. We loved his animated roles, we loved his comedies, ... then we saw 2003’s “Daddy Day Care”, and our love for him started to decline from that point. We were still in that phase of enjoying his presence, but this was definitely where we both found him to be more obnoxious than not. Actually, it was hilarious looking back on this performance as an adult and re-discovering just ho phoned in this performance is. He seems like he’s having fun, but he’s not being creative with his comedic approach, and just goes for bare-bone goofiness. What really busted my gut are when we need to have an emotional moment with Eddie Murphy, and his line delivery is about as mellow as they get. The little boy is average, but I find him the most tolerable of all the human characters. The little girl is a boring stick in the mud, and the little actress is easily the weakest of the bunch. Then we have the mother played by Marsha Thomason, and her delivery is also very lifeless. I will say that she’s exceptionally beautiful, and looks great on screen. 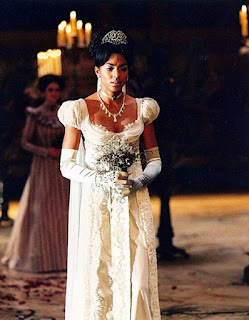 In fact, watching this at a young age made her one of the first African American actresses who I found attractive, so there’s some novelty in that. Now the teaser trailer for this film highlighted that there’s 9999 ghosts, just like in the ride, and that one unsuspecting house guest would come face to face with every one of them. This got me very excited for all the potentially creative ghost characters we’d be meeting in this film, only to discover that there’s really just five ghost characters at best. Every other ghoul is just a walk by background reference to the ride, which is extremely disappointing. The hand-full of ghosts we do meet sadly don’t leave much of an impression either, as their mostly seen in generic human form, and are very one note. The mansions master has too much emphasis on acting whimsical and his dialog gets repetitive. In general, I always love seeing Wallace Shawn, but here he’s mostly underutilized as the mansion’s footman. The only actor who’s consistently fun to watch is Terence Stamp as the evil butler Ramsley. He’s delightfully over the top, clearly having a ball in this role, but he also has range and can be genuinely sinister at times. He also has a perfect face for this film, as his sunken-in eyes and visible jaw structure make him fit right in with the spooky surroundings. 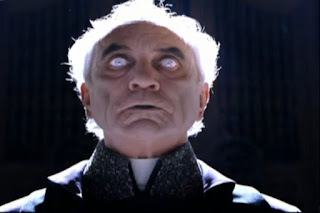 Actually, the more I looked at his face, the more he reminded me of the great Boris Karloff, which is a good thing. 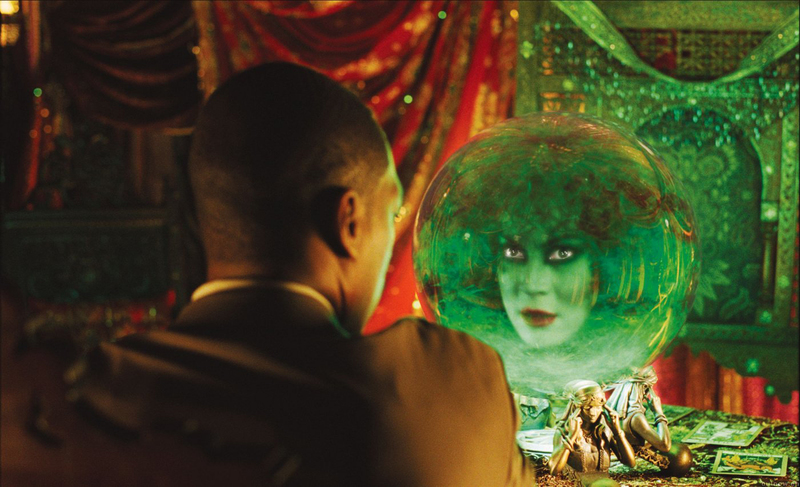 Finally, rounding up the noteworthy ghost characters is Madame Leota played by Jennifer Tilly … interesting casting choice to say the least. I think most people associate her with comedies like 1997’s “Liar Liar”, but this was the film that introduced me to her, and I thought she was fine in the role. Actually, it was just nice to see one of the original characters from the ride have a main role in the film. She was fun to watch, she had a quirky personality that wasn’t insultingly annoying, and the effects for her design actually still look good to this day. 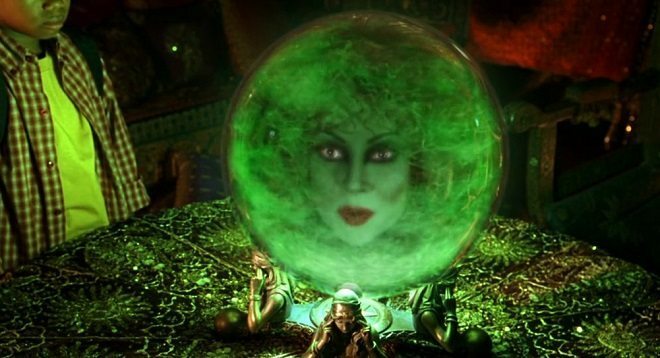 She’s basically a severed head in a green sphere, and every time I see her I’m reminded of that scene from “The Wizard of Oz”, with the Wicked Witches face appearing in the crystal ball. 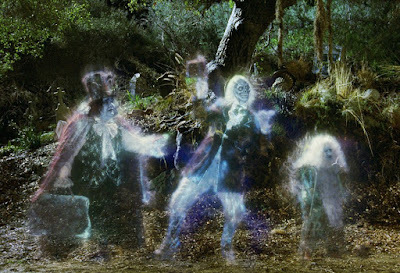 The remaining ghosts are all rounded up in one very short and disappointing graveyard scene, which consists of one quick tracking shot that’s so fast we can’t appreciate any individual ghost designs, and the rest is shown from the perspective of the family looking out the window of a carriage. This scene to me should have been like the equivalent of the Cantina scene from “Star Wars”, where we take the time to see various unique creature designs in an environment brimming with personality, and subsequently adding layers to its own set universe. Instead this little scene just resorts to a poorly animated skeleton horse, an un-apologetically brief call back to the famous hitchhiking ghosts, and an insulting one note joke revolving around those awesome singing heads from the ride. Although I will say that I liked the effects for the singing heads, as it looked more like Ray Harryhausen’s stop-motion as opposed to generic early 2000’s CGI. More to the point, this whole graveyard scene should have been a musical number. The rides original theme song “Grim Grinning Ghosts” has always been one of my all-time favorite songs to hear around Halloween, and this was the perfect opportunity to bring that song to life in a big theatrical presentation. It would have also been a perfect opportunity to see all the various Ghost designs, it could have been visually fascinating, and maybe it could have been something on par with the opening “This is Halloween” song from “The Nightmare Before Christmas”. Instead, this film just rushes though it’s various scenes, makes a quick reference to the song, and squanders any potential for a memorable highlight. Actually, the passing is my biggest issue with this whole project, as boring scenes are padded out, while potentially awesome scenes feel like they’re on fast-forward. Here’s yet another example, there’s a scene in a mortuary where the family is attacked by zombies, and while both the set design and even the zombie prosthetic's all look fantastic, the whole sequence just goes by so fast that it can’t leave even the slightest impact on the viewer. Plus, this zombie attack marks the first dangerous obstacle for our family to face, and it happens way late into the film. Personally, I think this movie should have set some stakes earlier, and then gave us a balanced mix between both playful encounters and spooky encounters. 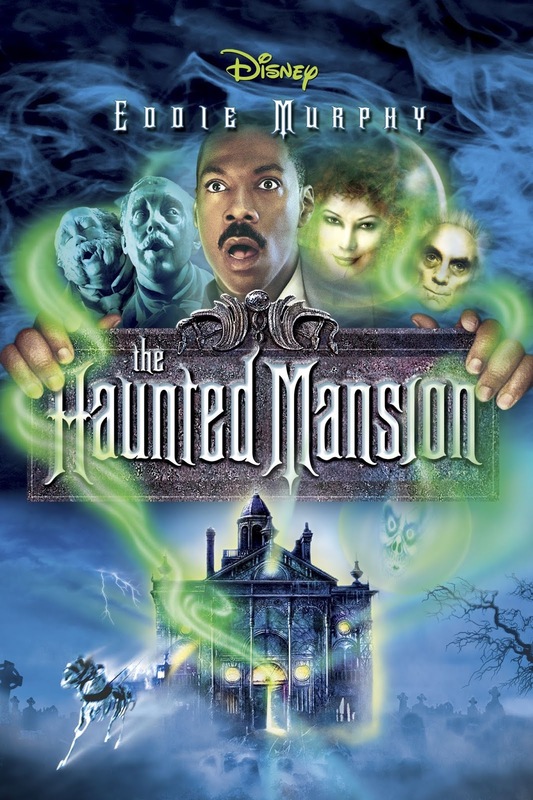 The absolute best scenes in this film are right around the start of the second act, in which the family first splits up and begin to explore the mansion. I love the editing during this one montage, as the film creatively cuts back and forth between both the kids and the father interring different rooms in the house. 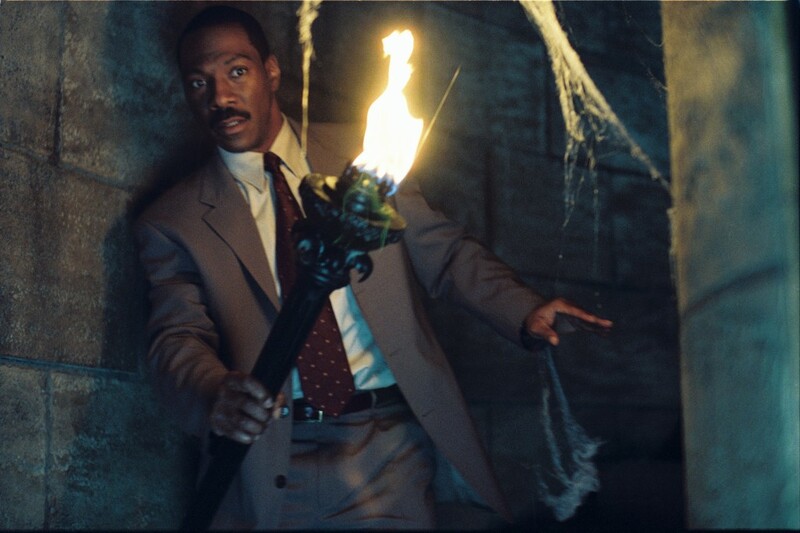 I also like how the haunted elements quietly sneak into play, like the paintings transforming, an ominous black bird that seems to be following them, a random door that appears to be breathing, and my favorite little touch of all is Eddie Murphy looking into a mirror with his corps looking back at him. This whole series of little haunted events was paced very well and it’s the only time when I felt like I was going on a walkabout in a spooky setting. It’s also where we get to admire the set designs, and the mansion begins to feel like an endless maze with dark secrets waiting to be discovered. Unfortunately, once the family reunite and begin their scavenger hunt, things just get rushed, and the further haunted events come off as average. Now we come to the third act of the movie, and once again, any positive aspects that took shape during the middle suddenly take a complete nose dive with this finale. Lots of exposition dumping, weak emotional moments, rushed action that should have been more creative, or at least fun, and a set-up that we’ve seen one too many times. What we get is a completely uninspired climax in which the mother is being forced to marry the Ghost, which leads into the ceremony getting interrupted by our heroes, and … gosh, I’m so sick of this being the climax in so many family centered Halloween films. 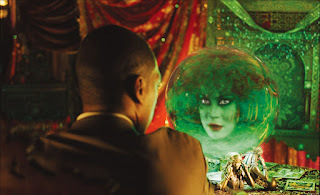 We had the same climax in “Beetlejuice”, the same thing happened again in “Corpse Bride”, and heck, it even happened again, AGAIN in “A Series of Unfortunate Events”. Also, this is yet another example of this movie not taking advantage of all the Ghosts present in this story, as only five people are present for the wedding, when that place should have been packed with a variety of different ghouls and spirits. 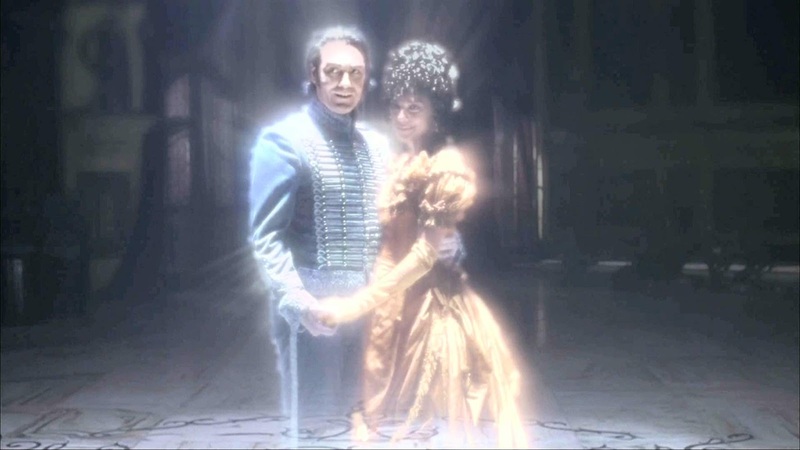 Personally, I always felt that this wedding should have happened in the middle of the movie, and the mother dying of poison should have been the driving force for our family to go on their spooky adventure, not just to lift a curse, but to save their mother. I think that would have been a far more compelling movie, and a better motive for our hero’s rather than just wanting to leave. Yet another annoying aspect of this finale is just how quickly everything wraps up. A random fire dragon takes the villain to Hell, the curse is lifted, and our spooky venture abruptly closes on a very random shot of the family car driving down the highway in the middle of the Ocean … because that really fits with the look and mood of the film. Even the credits are lousy, as it’s just your typical black backdrop, with a dated, out of place hip-hop song playing over everything. Couldn’t they have had concept art, or just atmospheric shots of the Mansion grounds as a backdrop with appropriate spooky music playing, or maybe even a cheesy Halloween song? Heck, Disney put the time and money into Raven Symone’s “Superstition” music video, why not have that as a backdrop for the credits. 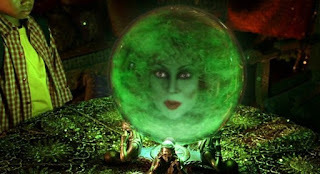 I suppose we do at least get a decent post credit scene with Madame Leota floating around in the limbo world of mansion items, while also reciting the famous “Hurry Back” line that closes the theme park ride. When all is said and done, Disney’s 2003 movie “The Haunted Mansion” is clearly a missed opportunity, not something I’d write off as a good film, but I can’t say that I have any real negative feelings for it either. It did keep me entertained as a kid, and I suppose it's held up for some nostalgic novelties. I do think that the Haunted Mansion ride deserves a better movie then this, one that develops and explores the world further, and maybe even focuses on the ghosts as main characters as opposed to the humans. Still, as this remains the only movie adaption, I’ll take it for what it is, as it’s not completely devoid of spooky charms that get me in the mood for the Halloween season. It looks great, the colors are nice and it really doesn’t hurt me to watch it. Having said that, there are still so many better films to watch around Halloween then this, films with better characters, more creative stories and some even with stronger morals at the center. I hope some day Disney will give us a proper adaption of my favorite theme park ride, as the possibilities are still there, and with their recent success of animated films, I could see them learning from their mistakes and delivering something far superior. Heck, Henry Selick did both “The Nightmare Before Christmas” and “James and the Giant Peach” under the Disney banner, so why not call him in to work on a stop motion version of “The Haunted Mansion” … it could be done. So, until I ever get that better film, I’ll just subtle with the live action 2003 film, as I truthfully find it's mediocrity better then nothing at all. 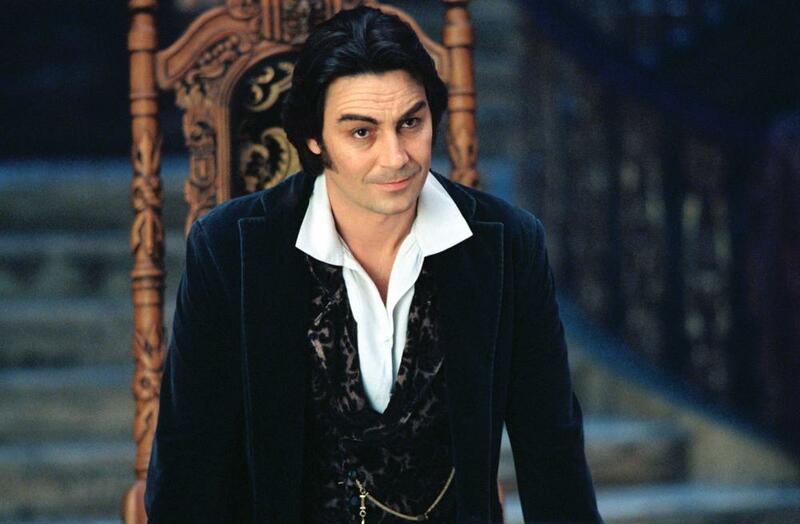 I give Disney’s 2003 movie “The Haunted Mansion” 2 ½ stars out of 5.